It has always been my belief that the vast majority of men, if not all men, have seriously wondered at some point how they would fare on the field of battle. War, for all of its wretchedness, offers men a clear picture of their inner virtue — or lack thereof. These “What if?” games are unnecessary, however, as Dom L. Scupoli Apulia’s The Spiritual Combat and a Treatise on Peace of Soul demonstrates. The Italian author pointed out in 1589 what many men in 2016 fail to realize — bombs are already dropping all around us. Spiritual warfare rages in all directions. A man not only can be a war hero, but he must — his very soul depends upon it. Being “neutral” in this war is not an option, and since tomorrow is never guaranteed it is best to pick a side now. When the devil has enmeshed the soul in sin, he uses every means at his disposal to distract its attention from anything that would enable it to recognize the terrible condition into which it has fallen. The devil is not content to stifle every inspiration from Heaven, and to suggest evil thoughts in their place. He endeavors to plunge it into new faults, either of the same or a more vicious nature by supplying dangerous opportunities to sin. If you seek to become a virtuous man or woman, then The Spiritual Combat and a Treatise on Peace of Soul is a must-read. If you are a Christian who has ever wondered, “Why do bad things happen to good people? Why does God foist trials and tribulations upon me?” then Scupoli’s work is for you. I would rank it with Francis De Sales’ Introduction to the Devout Life and Saint Augustine’s Confessions as an essential addition to your library. Editor’s Note: I will send a copy of “The Spiritual Combat and a Treatise on Peace of Soul” to the first regular reader who asks. Politicians and pundits use every election cycle to talk about the need for “new” ideas. Increasingly secular yet tech-savvy societies are always looking for the next “new” idea, and yet they wonder why the same old problems persist. The more I read, the more I think that many “old” ideas should be dusted off and embraced. Take Thomas à Kempis’ “The Imitation of Christ,” written in 1418, for example. Just like our good friend Saint Augustine, it’s been a while since he walked the earth. Regardless, Kempis’ devotional book is one that would be beneficial to Christians and non-Christians alike. Even if one were to weirdly strip out all references to Christ, much of the wisdom regarding the right way to live would still remain. Atheists say that Christ was not the Son of God, but if you asked them if the man — from a purely historical point of view — lived a life worth imitating, then the vast majority of them would probably say yes. Facebook, Twitter, Tumblr, Snapchap. CBS, NBC, ABC, CNN, MSNBC and FOX. Xbox, Playstation, Nintendo. Warner Bros, Sony, Disney, Universal and Netflix. NFL, MLB, NBA, NHL and UFC. Amazon, Ebay, Microsoft, Apple and more, more, more always vie for our attention — and we give it to them. Addiction to the temporal is a horrible thing, but it is hard to recognize because it sneaks up on a man. It slowly slithers around the psyche. Its initially brings warmth and joy, but in the end it’s all a ruse. When it has completely enveloped the whole of a man’s being it constricts like a python and suffocates his soul while he sleeps. In the addicted man’s waking state he is, on many levels, unaware that the most important part of him is in peril. He is sad. He is lost. He does not know why he is never complete, and so he turns to the very thing that fills him with venom while he dreams. Enter Thomas à Kempis, who breaks down the blueprint for a happy life into four parts: 1. Useful Admonitions for a Spiritual Life. 2. Admonitions Concerning Interior Things. 3. Internal Consolation. 4. The Blessed Sacrament. Ask yourself if there is a reason why politicians never mention “The Imitation of Christ” as one of their favorite books. “Who is so wise as to be able fully to know all things? Therefore, trust not too much to thine own thoughts, but be willing also to hear the sentiments of others. Although thine opinion be good, yet if for God’s sake thou leave it to follow that of another, it will be more profitable to thee. For I have often heard, that it is more safe to hear and to take counsel than to give it. It may also happen that each one’s thought may be good, but to refuse to yield to others when reason or a just cause requires it is a sign of pride and willfulness,” (Book 1, Chapter 9). “How happy and prudent is he who strives to be such now in this life as he desires to be found at his death. For it will give a man a great confidence of dying happily if he has a perfect contempt of the world, a fervent desire of advancing in virtue, a love for discipline, the spirit of penance, a ready obedience, self-denial, and patience in bearing all adversities for the love of Christ,” (Book 1, Chapter 23). It takes just two sentences for the author to give readers seeds that will bear a harvest of joy for all the years of their lives. As a Catholic, I would implore readers not to take Christ out of the sentence, but I will concede that doing so does not negate the rest of the advice embedded in the text. Editor’s Note: I will send a copy of the book to the first regular reader who asks. It is a rare occurrence to read a book and come to the conclusion that the writer’s initial inspiration was perfectly realized upon its completion. 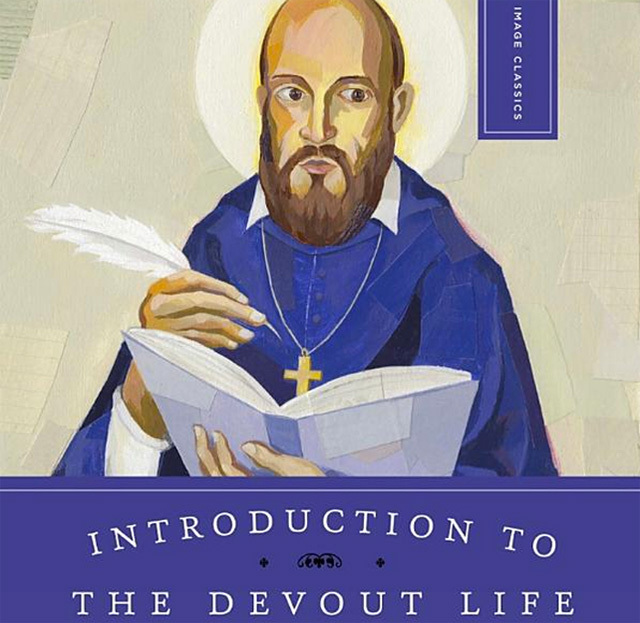 Saint Francis De Sales’ “Introduction to the Devout Life” may have been published in 1609, but its stunning insight into the human condition makes it a must-read in 2015. In another 400 years, it will still be leaving readers in awe. While De Sales wrote for a Christian audience, the blueprint for a healthy civil society he presents is one that men and women of all faiths (or no faith) would be hard-pressed to criticize. The virtues he seeks to cultivate in his readers may be motivated by a desire to instill a love of God in as many hearts as possible, but at the end of the day he is still talking about honesty, humility, patience, charity, fortitude, prudence, etc. Even more impressive is how De Sales addresses the reader (“Philothea”) directly, yet with a delivery that feels like a kind and gentle father imparting time-tested wisdom to a child. De Sales (who must have consulted countless men and women from all walks of life) has such an exquisite grasp of humanity’s trials and tribulations that it is hard not to feel as though he already knows everything about you — yet still offers unconditional love. “We apply the term vainglory to whatever we assign to ourselves, whether something that is not actually in us or something in us but not of us, or something in us and of us but not such that we can glory in it. Noble ancestry, patronage of great men, and popular honor are things that are not in us but either in our ancestors or in the esteem of other men. Some men become proud and overbearing because they ride a fine horse, wear a feather in their hat, or are dressed in a splendid suit of clothes. Is anyone blind to the folly of all this? If there is any glory in such things it belongs to the horse, the bird, and the tailor. It is a mean heart that borrows honor from a horse, a bird, a feather, or some passing fashion. Others value and pride themselves because of a fine mustache, well-trimmed beard, carefully curled hair, soft hands, ability to dance, play cards well, or sing. Such light-minded men seek to increase their reputation by frivolous things. Others would like to be honored and respected by men because of a little learning, as if everyone should go to school to them and take them as their teachers. They are called pedants for this reason. Other men have handsome bodies and therefore strut about and think that everybody dotes on them. All this is extremely vain, objectionable, and foolish and the glory based on such weak foundations is called vain, foolish, and frivolous. The depth and breadth of De Sales’ understanding of humanity is a marvel to behold. If for no other reason, “Introduction to the Devout Life” shines a giant spotlight on just how far we’ve fallen as a culture. The book was written for the likes of carpenters, soldiers, sailors, and tailors — not academics — and yet the man on the street in 2015 would likely have a hard time digesting much of De Sales’ intellectual discourse. If you have ever sat alone in your bed at night and tried to plumb the depths of your soul to root out what is rotten and realize what is wholly good, then I cannot recommend Francis De Sales’ “Introduction to the Devout Life” enough. If it is read with an open mind and seriously meditated upon, then I have no doubt that it will truly change your life for the better.